Youth violence has had a serious effect on the Commonwealth of Massachusetts. 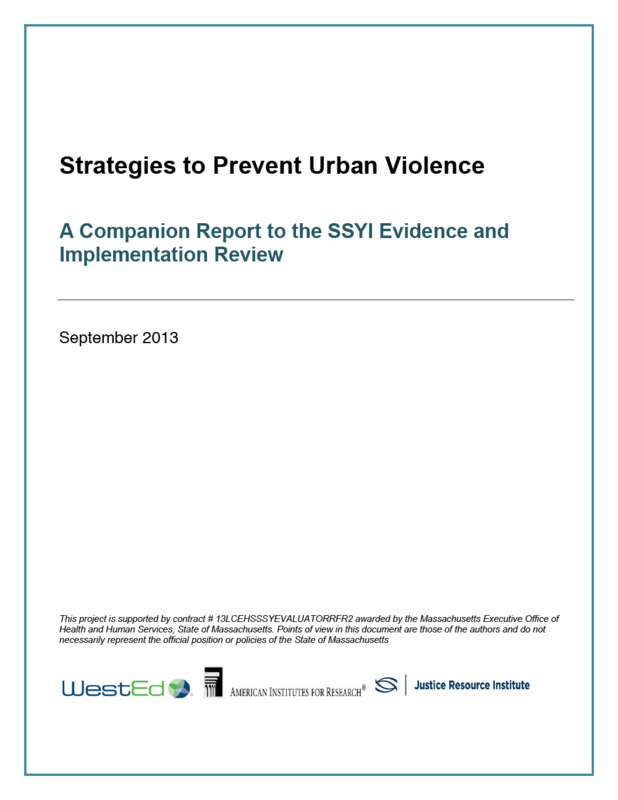 Commissioned by the Massachusetts Safe and Successful Youth Initiative (SSYI), this report examines the strategies used by the federal government, states, and cities to address serious violence among youth. The goal of this work is to provide Massachusetts with a sense of where its own violence prevention efforts fit among the range of initiatives implemented in localities nationwide, and provide additional insights on strategies that SSYI may want to employ in the future. A team led by the American Institutes for Research and including WestEd and the Justice Resource Institute, produced this strategy review. The review complements the report, What Works to Prevent Urban Violence Among Proven Risk Young Men? : The Safe and Successful Youth Initiative Evidence and Implementation Review. What Characteristics of Bullying, Bullying Victims, and Schools Are Associated with Increased Reporting of Bullying to School Officials? This study, prepared by researchers in WestEd's Learning Innovations Program, tested 51 characteristics of bullying victimization, bullying victims, and bullying victims' schools to determine which were associated with reporting to school officials. It found that 11 characteristics in two categories—bullying victimization and bullying victims—showed a significant association with reporting. The study also notes the high percentage of respondents who experienced bullying but did not report it. The objective of this paper is to answer an important policy question: Does juvenile system processing reduce subsequent delinquency? Cowritten by WestEd's Anthony Petrosino and Sarah Guckenburg with Carolyn Turpin-Petrosino for the Campbell Collaboration, it presents the background, objectives, methodology, and results of this systematic review, as well as a list of references and an appendix. This discussion paper identifies the progress made in using evidence-based violence prevention programs and discusses how evidence is translated into effective community-based programs. Strategies for closing the gap between evidence and implementation are also presented.